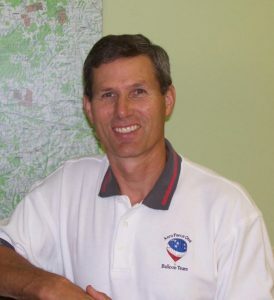 Bill Smith is a native Kentuckian with an extensive background in aviation. During his 30-year military career with the Kentucky Air National Guard, he specialized in aircrew survival, air traffic control and fire protection. While serving as a combat controller from 1988-2000, he made 246 static line and freefall parachute jumps and served as a jumpmaster. He retired from the military at the top enlisted rank of chief master sergeant in February 2003 and is now focusing full-time on ballooning. Bill has a commercial pilot rating and has accrued over 1,300 hours in hot air and gas balloons. He is a four-time winner of the BFA long jump competition, flying over 750 miles in his record-breaking effort in 2017, earning the prestigious Shields-Trauger Award from the Balloon Federation of America (BFA) and the Montgolfier Diploma from Fédération Aéronautique Internationale (FAI). Bill is the seventh U.S. pilot to earn the FAI’s gold sporting badge for ballooning with three diamonds. In 2018, he finished second place as the co-pilot of the USA-2 team in the Gordon Bennett gas balloon race. Bill was the president of the Balloon Society of Kentucky 2008-2009 and is a frequent contributor to its newsletter as well as BFA's Ballooning magazine. Bill often shares his experiences by training student pilots and speaking at safety seminars and conventions. He also has a balloon repairman certificate and operates Aero Force Balloons Repair Station in Shelby County, Kentucky. US long jump record and first diamond performance for FAI gold badge.